This is a product jointly developed in close partnership with Advantage Engineering that combines a Novatec NWB-DC+ drying and conveying system, with the Advantage Engineering industry leading Sentra Mold Temperature Control (TCU) technology built into the dryer cabinet! Included is the Advantage patented AVT Modulating Valve technology that provides the most precise mold temperature control and resistance to plugging on the market. A single Siemens Touchscreen Control is used to interface with all the functions of the system. The Siemens PLC controls the dryer functions and communicates directly with the onboard Advantage microprocessor that controls and monitors all functions of the TCU units(s). Both the dryer and TCU use their native stand-alone controls with a convenient single point interface on the touchscreen. 5 – Year warranty standard! We’re very excited about this technology and we hope you, our customer will be as well. 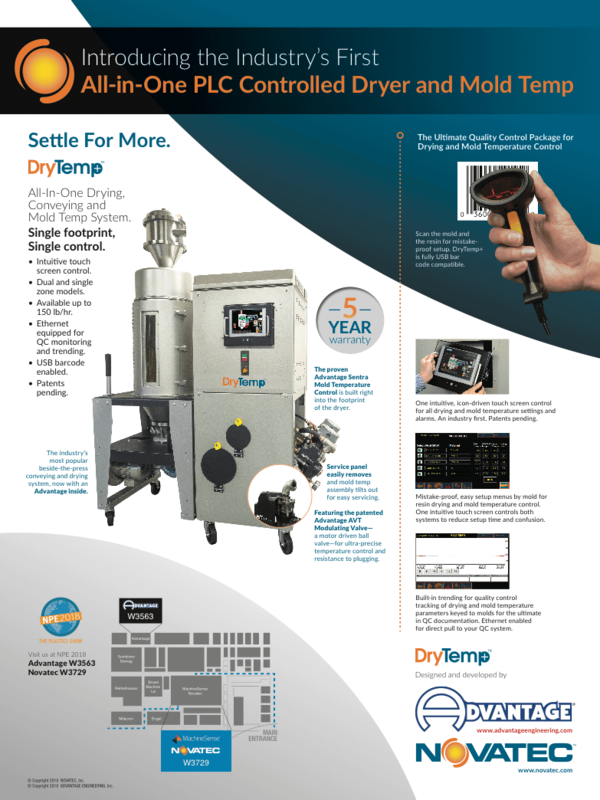 We asked ourselves why our competitors who own both drying and TCU technologies hadn’t done this before, and we couldn’t think of any reason except short-sightedness…so we did and we patented the features and approach!